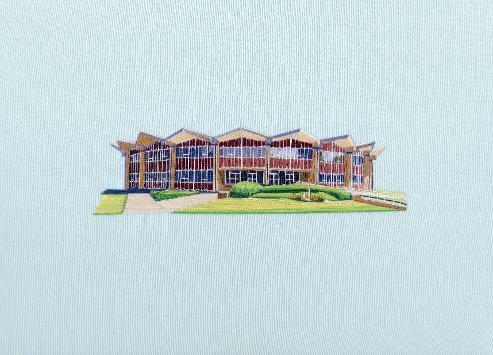 "I was very interested in the visual aspects of the tones generated from the stitching. I noticed that the structure of the building itself, a giant circle, crated small circular patterns that reminded me of our daily circadian rhythm. Rather than be concerned with the tonal language at first, I decided to orchestrate the saxophone parts in a way that emphasized the structural integrity of the building. To mimic the difficulties of day to day life as a fine arts student, I explored a simple algorithm of 1+2+3 to insert silences(instability) to the top three saxophone voices. The baritone saxophone on the other hand dredges along in a low, aggressive melody. Each voice begins to become more and more disjunctive as the silences increase and the original baritone saxophone melody is echoed. After a total break in the parts, the voices come back together echoing the original "support" motive taken from the stitch itself. I find this approach based completely on the visual merits of this stitch to be both intriguing and challenging for the performers." "In a stark contrast to the first piece, I wanted to create a piece of music that explored the intrinsic tonal language of the stadium stitch. I created several four voice layers that I then analyzed for a chord progression, changing a few notes here and there for their tonal merits (breaking out of the stitch content if you will). To mimic the football experience, the performers are given short 28 note rows that they play with variable rule sets with short pauses at the end of each phrase. At times playing strictly together as a team, and at times playing in ways that completely disregard each other. Each player is given an event where they can improvise freely in whatever style they choose before coming back together as a team unit and ending triumphantly." 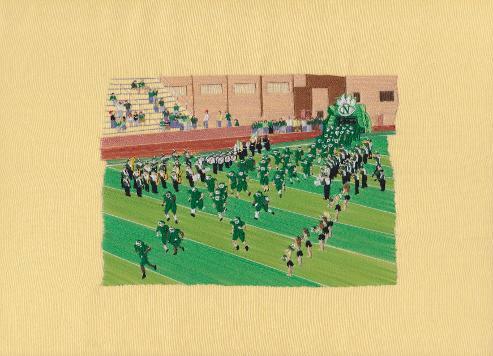 Dr. Bill Richardson collaborated with Cassia Kite's Soundstitching Compositional Translations of the Bearcat Stadium Soundstitching to create a Jazz Combo work to be performed by NWMSU students. This is his explanation as to how he approached the work. Evan Grimes, Nick Foster, Benoit Gauthier, Michael Sears, Josh Miller, and Jake Adamek. The Bearcat Pawprint Images below are connected to participatory performances of the "RED" composition that provided an opportunity for the public to collaborate by interpreting one of my Soundstitching works in the exhibition at Northwest Missouri State University.